We have been using HW salt in our office tanks for a while with great success. The salt is very consistent and mixes quickly and clean. With no unnecessary added chemicals that most salt mixes add to appear clean, HW has passed the test, and standards that many public aquariums and high end displays require in a salt mix. I've been in the hobby for 20 years now and had never used this before.Ive always used IO or RS.The HW mix is far superior!It is 100% synthetic so you don't have to worry about binding agents like clay.Also mixes easily and you don't end up with crap in the bottom of your mixing container.It may be pricey ,but it is well worth every cent! Love this salt. Mixes fast, clean, and consistent. Keeps my Alkalinity where I want it. We've been using this salt for 2 years. Gives us a stable, consistent environment for our corals contributing to rapid growth and great color. Mixes clear within 10 minutes. We wait for a few hours to use it but from appearance it would be fine almost immediately. Would recommend this salt to anyone who wants to eliminate one area of possible hassles and problems. 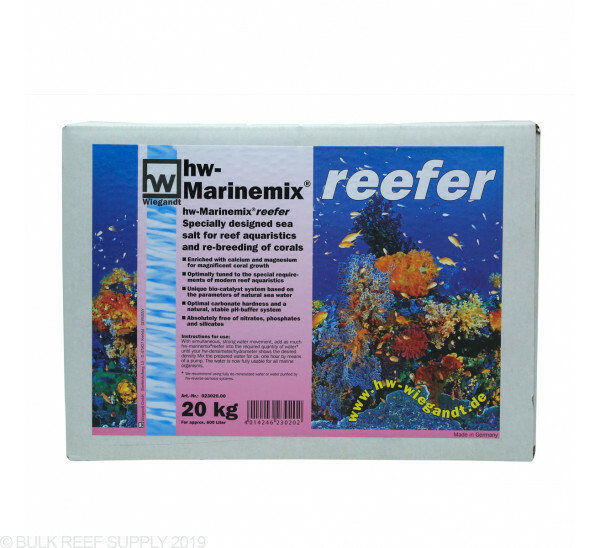 Mixes well and noticeable coral growth. I switched to this salt in anticipation of doing a modified Triton method for a new tank I have not set up yet. I have used RSCoral Pro since day one in my first tank and my present tank a JBJ RL45 and loved the mix. However, I am so glad I switched to the H-W Reefer mix. This stuff mixes quickly, clear, consistent test parameters and has no calcium deposition in my mix bucket (a big problem with the RS mix). I have made 6 water changes of 10% since purchasing the product. PH has been more manageable and there is a noticeable growth rate increase of my SPS and LPS. Dosing of my 2 part has had to be increased by 2.5ml/day. Can't wait to get an APEX for the new tank andset up. My corals love this salt. They are thriving. Third salt bran I have used and by far the best. No Precipitation. Parameters spot on for Triton. I have used this salt since switching form a 60 gallon to a 150. 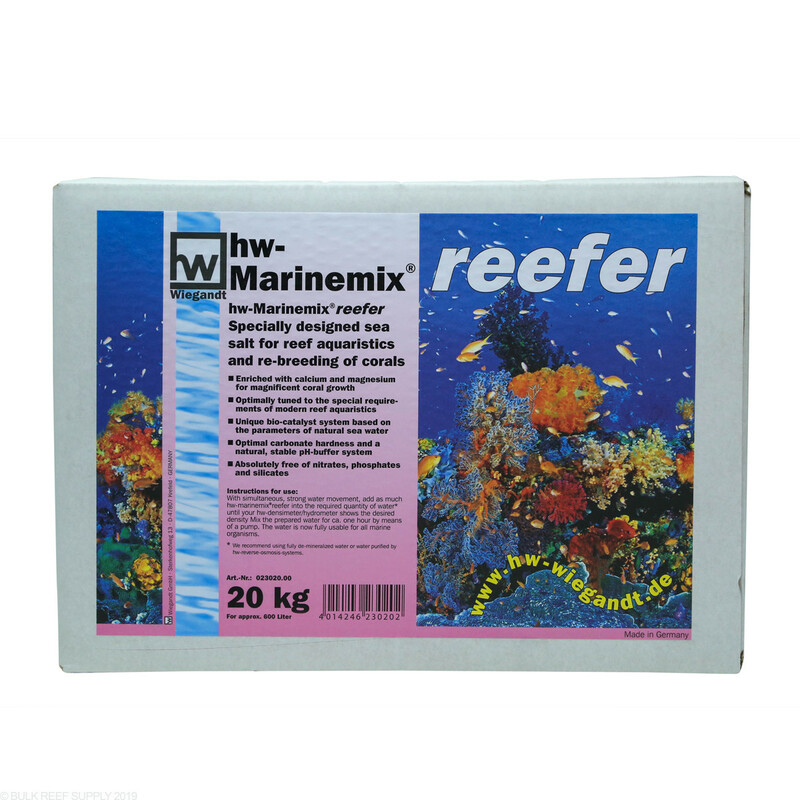 Mixes great, doesn't leave a residue in my 30 gallon drum like others have experienced, and the corals seem to like it. Downside is the magnesium is over 1500 every time I test using the Salifert kit, and test multiple times to compare results. Thought I had set the doser up wrong initially, but rechecked and wasn't even dosing Mag yet. Other parameters always test good when water change is done, then I dose accordingly. I used this and the Hw Professional many years ago until LFS stopped carrying it. Best salt I have ever used, mixed the cleanest and most consistent without alk being way high. Once I wss no longer able to get Hw I chased that high quality, clean, consistent, lower cost salt mix for many years. Only found Tropic Marin salts to be of equal quality but much higher in cost. Those that claim to have issues with this salt may be mixing with tap water, water that is too hot or cold or adding the salt too fast or before adding water and mixi g to 1.023 will yield low alk and ca since advertised levels are 1.025. Mixes clear and no settling. Only complaint is I couldn’t find listed parameters. Switched from Reef Crystals by Instant Ocean to HW....immediately notice a difference in water clarity on my 300 gallon reef tank. Salt mixes very quickly at room temp and absolutely no residue in the container and mixes throughly with just a couple smallnpower heads churning things up. Have gone through about 200 gallons of water on the HW and with each change I see my water clarity improve, corals growing much better and more vibrant colors and very consistent water parameters. I maintain a 40 gallon change every 2 weeks and plan to continue using HW Reefer. Have already recommended to several friends, especially after they see my tank! I am currently using tropic marin actif salt mix. 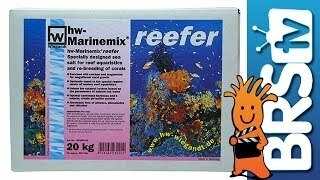 If I wanted to switch to this hw-Marine Mix, can I just switch for my next partial water change or do I need to make the transition more gradual? How much do I use for this 30 gallon tank? I tried to find the direction but nothing for mixing direction per gallon. Salt mixes typically do not include an exact amount to use rather you will use a refractometer and slowly add salt until you reach 1/026 SG or 35 PPT. Typically you can start with 1/2 cup per gallon and increase from there. Is this packaged in one bag in the box? This will be an individual bag with all of the salt. Feel free to let us know if you have any further questions. If i use this salt mix will i need supplements? Great question! HW is optimized with amino acids and organically stabilized iodine, it contains a proprietary blend of trace elements so there really isn't a need for additives. at what salinity was this tested at? Great question, this was tested at 1.026 SG or 35 PPT. Feel free to let us know if you have any further questions! I can't seem to find the composition of the ingredients of this salt. Do you have the list of the ingredients/percentages etc.? Thanks.